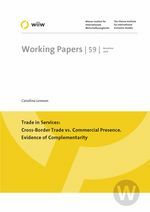 This paper investigates empirically the relationship between trade and FDI in services. Using bilateral data on US foreign affiliates' sales and trade as well as data on barriers to FDI, the relationship is investigated using different panel techniques, including fixed effects and pseudo-maximum-likelihood techniques. As a first step, bilateral exports are explained by foreign affiliates' sales. Then, in order to control for endogeneity, a cross-price elasticity approach is used, in which exports are explained by the cost of investing abroad. The paper additionally investigates whether the relationship in services differs from that in goods, whether it depends on the motivations for FDI and varies across services. The main findings indicate a robust complementary relationship between trade and FDI in services, which is higher than that found in the goods case and mainly related to the horizontal type of FDI as well as to 'other private services'.